Although packing slips are sent with every Grainger order you place, they don’t always make it successfully through the transit process whether they get missed, misplaced, thrown away or recycled. When situations come up, we have the solution. Our convenient electronic packing slips service lets you print your packing slips online within your order history the day your orders ship. This way you have what you need for your receiving or invoice payment process. Q1: What if I don’t have a link to my packing slip? A1: If your order has not been shipped yet, a packing slip will not be available. Only some packing slips that are not shipping from a Grainger location will be available. If you don’t see a packing slip, you can still contact Customer Service at 1-800-GRAINGER (472-4643) to get this document. Q2: Why does the “View Packing Slip” link display a large blank space at top? A2: Due to formatting variations across systems, the packing slip may appear with a large blank space at the top. You should see the packing slip in the bottom of the pop-up screen. Q3: Why is my packing slip cut off when I print it out? A3: If you’re printing the packing slip directly from your internet browser, make sure you have the checkbox next to “Fit to Page” selected. Q4: Why are all of my products from my order not on my packing slip? A4: Your order most likely shipped in more than one box. We will provide a packing slip for each individual shipment. 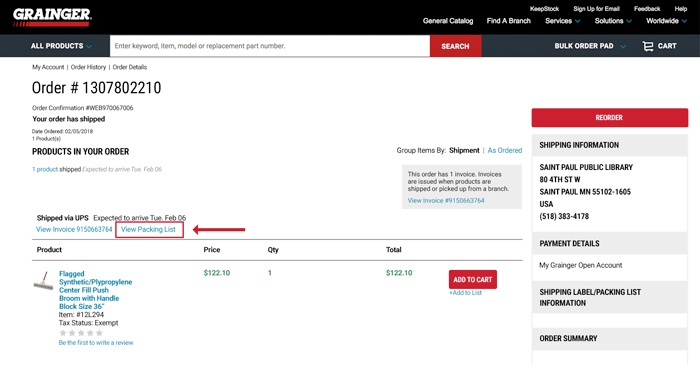 Once the remaining products on your order ship, you will see another packing slip link within your order. Q5: If I am an E-Pro customer, will I also be able to access my electronic packing slip from Grainger.com? A5: If your product is shipping from a Grainger location, yes! If your product is not shipping from a Grainger location, please contact Customer Service at 1-800-GRAINGER (472-4643) to obtain a packing slip. Q6: Why can’t I access my packing slip? A6: This functionality is only available for Grainger customers that have an account number. If you are purchasing as a consumer or without an account, you can still contact Customer Service at 1-800-GRAINGER (472-4643) to obtain a packing slip.